Many years ago, when I traveled in Italy and Greece I got hooked on fruit and yogurt. To this day, thick Greek yogurt with berries or a drizzle of honey is my favorite "go to" late night snack. This is a little fancier and perfect for company on a warm summer night, but still easy and so healthy! And much lower in calories and fat than the original recipe. Hope you enjoy! Place a single layer of berries on the bottom of 8 oz. ramekins. 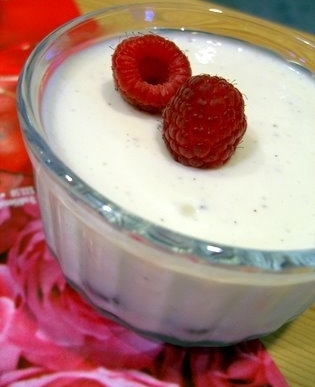 In a medium bowl, whisk together yogurt and 1 cup of the cream/milk. In another bowl, sprinkle the gelatin over the surface of the remaining 1/2 cup of milk. Let stand for 5 to 10 minutes. Microwave the gelatin and milk for about 30-45 seconds, or until gelatin is melted (rub between fingers to test grittiness) and then stir in sugar and vanilla. Whisk the gelatin mixture thoroughly into the yogurt. Pour into the fruit-lined ramekins and refrigerate until firm. Apx 3 hours. If you wish to unmold for a fancy desert be sure to grease your ramekins.